Music Together of Bay Ridge - What is Music Together? Weekly classes featuring singing, dancing, instrument play, rhythm games, nursery rhymes and chants, movement activities, finger plays, peek-a-boo games -- all sorts of activities combining music and movement! 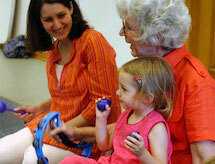 Music learned through playful activities that respect and support the unique learning styles of very young children. Parents and caregivers, regardless of their own musical abilities, contributing to the enrichment of the child's music environment in class and at home. Quality time with young children that benefits their emotional, intellectual, social, speech, language, and physical development. Great recorded music to continue the classroom experience all week long at home -- streaming, download, mobile app, CDs and songbooks! FUN -- singing, dancing, playing, and learning!